For the record, I'm not like Joe. I don't mean that in the sense that my facial hair isn't fluffy like a kitten, but more that I'm not a big Monkey Island fan-boy. I never played the game growing up, nor any of the other LucasArts adventure games. Instead, I preferred mutilating things in Doom and, heaven forbid, playing outside. It's not that I dislike the genre though - I actually loved the Broken Sword games, for example. It's just that I could never be bothered with all that reading and Monkey Island pre-dated most of the 'talkie' adventure games by a few years. This is where the remake, The Secret of Monkey Island: Special Edition, comes in and it falls to me to see if Monkey Island is still a good game by today's standards. Remakes are often regarded as being the spawn of Satan of course, as they bastardise the original to conform to new trends in gameplay. Fortunately, you don't have to grab a Wiimote and dance around like an idiot, or spend obscene amounts of cash on a new graphics card for this. Monkey Island: Special Edition offers an optional graphical overhaul and interface (plus a few other bits, like spoken dialogue), but the actual content is the same as before - to the point where it clearly references the original even as you load the game. You simply could not get a more faithful rendition. Diving in for the first time is great - it starts off showing the old school loading image, then gently overlays and replaces it with the new graphics. A sort of "look how far we've come" combined with "look how faithful we've been to the original". It's like they do on CSI - magically increasing the resolution and adding pixel fidelity on an image - zoom and enhance! The plot of the game is based around a lanky lad with pale skin and long blonde hair who looks like he could be a sterotypical viking if only he wasn't so scrawny. 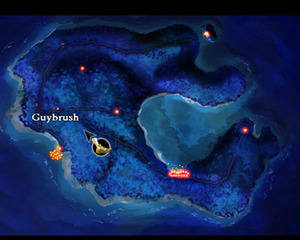 His name is Guybrush Threepwood and at the start of the game all we know about him is that he has come to Melee Island, deep in the Carribbean, because he wants to be a pirate. 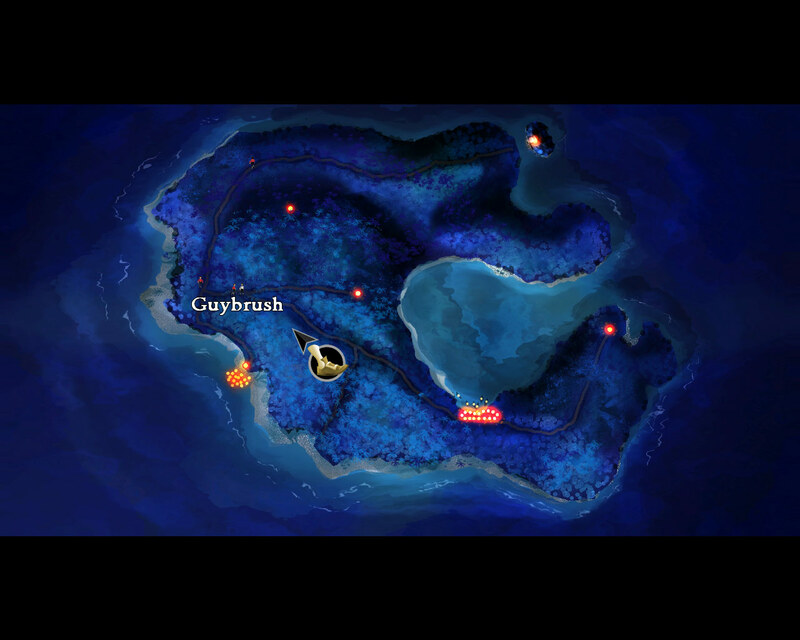 Guybrush, which I also imagine is a name for a masculinised loo-cleaning tool, drops into the local pirate bar and sets about talking to the local drunkards/pirate overlords. 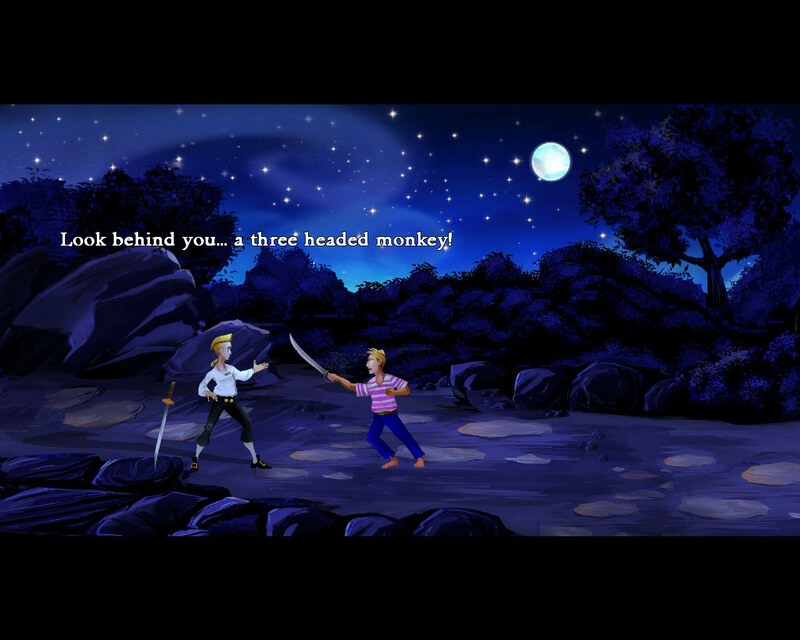 After chatting to the three commodores, Guybrush gets sent on three quests of pirate-esque calibre - dig up some loot, steal some loot and learn how to sword fight - or, well, insult sword fight. Scooting around Melee Island to do the quests is plenty fun, with the random twists and turns of any typical adventure game thrown in the mix - although nothing too convoluted to stop a player progressing. 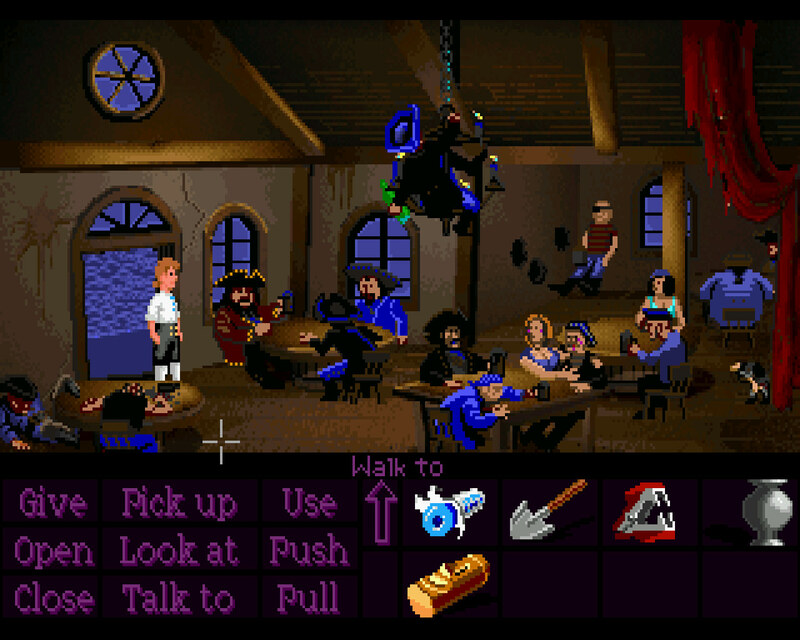 The puzzles aren't hugely taxing (though Joe would claim otherwise, having taken five years to finish the game the first time around) and see you getting involved in all sorts of escapades on your pirate-y endeavour. Guybrush gets a stint in the Circus, acquires free T-Shirts, learns a load of witty insults and wins the heart of the lady Governess - though only moments before she gets spirited away by the spirit of the pirate captain Lechuck, whose ghost haunts the sea and has kept all the local pirates land-locked. The writing is certainly continually humorous, but only rarely laugh out loud funny if I'm totally honest. While I thought the voice acting was pretty well done too, it's likely that fans of the original will likely claim otherwise and fall in to the the-book-is-better-than-the-film syndrome. 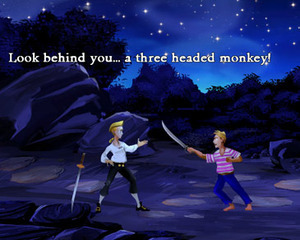 For us lazier people, the voices are a welcome addition and mostly fit the characters, however I personally can't say I enjoy the voice of Guybrush that much - he just doesn't seem to fit well - especially when compared to other strong adventure game male leads like George Stobart from Broken Sword. The good news is that you can easily turn on subtitles and cancel the volume, or just switch between Retro and Remastered mode at any point just by pressing F10. Despite the graphical overhaul the animation is still pretty rough in the remastered mode, to the point where it looks just awkward in some scenes because the characters don't move their hands when they talk or have any decent idle animations. Instead, they just stand their like Lego men, stiff and still. The reason for this seems to be that they have identical animations to the original version, just with redone artwork, which kind of suggests that Lucasarts didn't take the graphical overhaul far enough. Characters who don't move their arms when they talk look fine when everything is all pixellated and indistinct, but when the image is stylised and crisp, it falls into the uncanny valley a tiny bit. It feels like Lucasarts is trying to take the remake far enough to interest fans of the original game, but doesn't want to risk losing them by moving too far from the source. It's a commendable aim in some respects, I suppose - but as a newcomer to the game I'd really like to see a Remastered version that looked a bit more natural and leave the Retro mode for those who just want to bask in nostalgia.